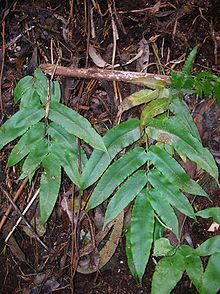 Coniogramme is one of three genera in the Cryptogrammoideae subfamily of the Pteridaceae family of ferns. A cultivated species, Coniogramme pilosa, is known as "bamboo fern." Coniogramme affinis (C. Presl) Wall. ex Hieron. Coniogramme falcata (D. Don) Salom. Coniogramme japonica (Thunb.) Diels—bamboo fern. Coniogramme robusta Christ ex Hieron.